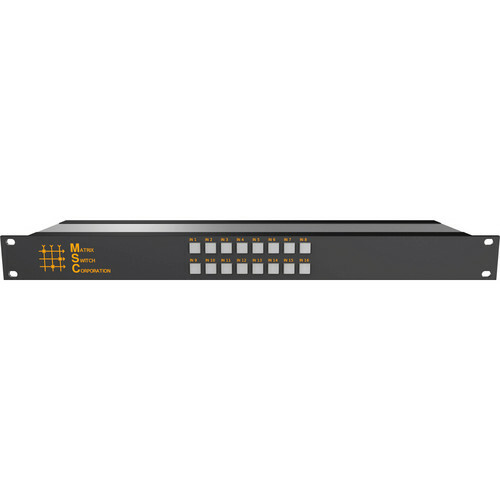 The Matrix Switch 16 x 1 HD-SDI/SDI Video Routing Switcher with AES3 Audio accepts multiple HD and SDI video inputs across 16 ports and switches a source across Quad output ports. In addition, it supports digital AES3 audio via BNC connectors and extends support for DVB-ASI signals. Supporting data transfer rates from 19 Mbps to 2.97 Gbps, the switcher, using automatic cable loss compensation, transmits error-free signals up to 1000’ (304.8 m). The 16 x 1 HD-SDI/SDI Video Routing Switcher with AES3 Audio features auto detection of standard SMPTE data rates which are re-clocked across each output for a jitter-free operation, and the auto rater detect logic bypasses all signals with non-SMPTE data rates. Control options consists of text based protocol (MASCOT) over TCP/IP port, RS-232 serial, or web page interface. The switcher is compatible with optional Matrix Switch Corporation TCP/IP remote panels. It is suitable for use in broadcast studios, post-production facilities, ENG/OB applications, remote trucks, and flyaway video production cases.